Can you guess how many puppies our beautiful patient Annie had? Hint: counting the spines and heads can be useful during this exercise. Annie the Corgi visited us recently to have her progesterone levels checked prior to whelping her first litter of puppies. Progesterone provides a good indication of when a dog is ready to deliver puppies. Annie also underwent a radiograph or ‘puppy count’ Xray to give her owners an indication of the number of puppies to expect. Should owners plan to allow their dog to give birth at home it’s important to know how many puppies are expected in case fewer puppies arrive, as they will know immediately that veterinary intervention is required. In Annie’s case, however, her owner later had concerns about her ability to give birth naturally and elected for her to undergo a Cesarean section for safe delivery. 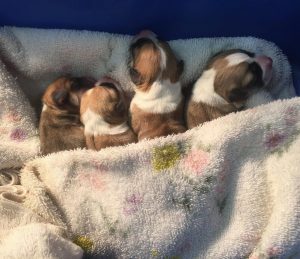 C-sections require two separate veterinary teams, “Team Annie” to monitor her during her procedure, and “Puppy Team” to ensure each puppy is stable, dried, and warmed immediately after surgery, until Mum has recovered. Annie and her puppies are now doing very well at home, but the team at Uni Vets Camden are looking forward to future puppy cuddles.